This cheap and easy hanging garden tool organizer keeps all your hand tools, gardening gloves, twine and more in one place on your garage or shed wall! 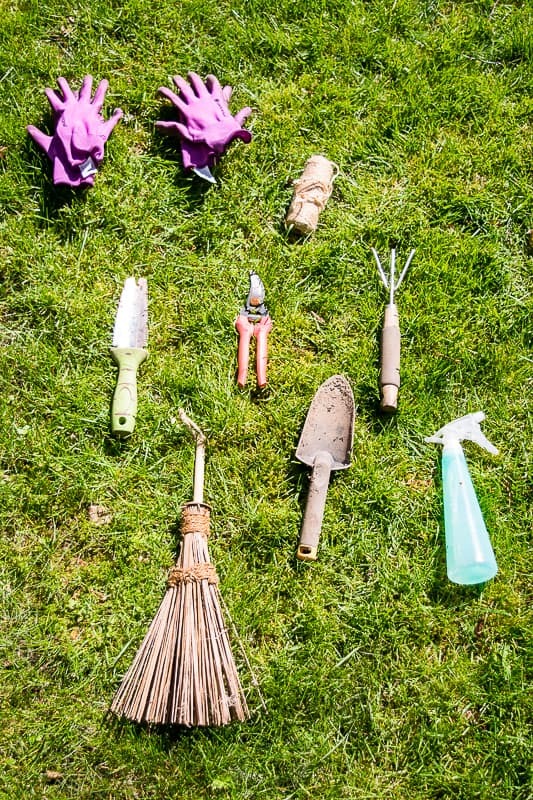 At the end of a long gardening session, my hand shovel, gloves and other tools always end up scattered throughout the shed. 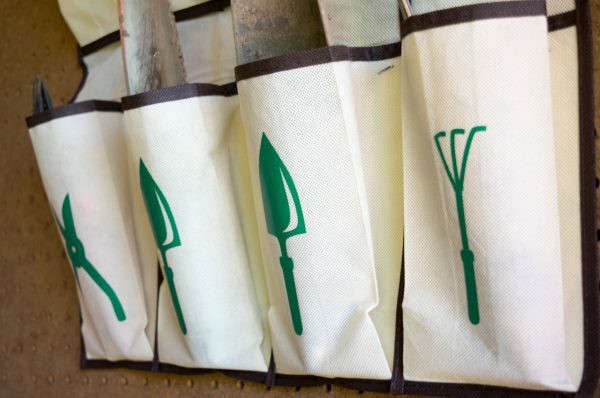 When it’s time for another gardening project, it took way too long to hunt things down. 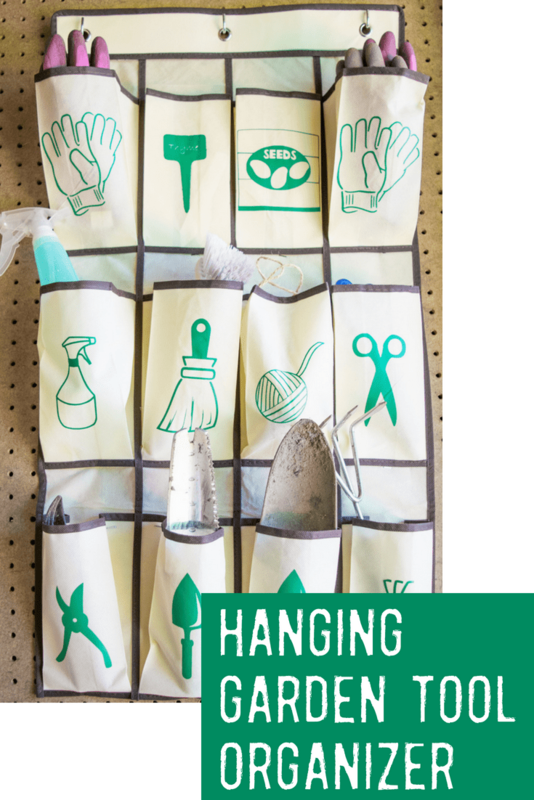 With this simple hanging garden tool organizer, there’s a place for everything and everything stays in place! This post contains affiliate links for your convenience. Purchases made with these links may earn me a small commission at no additional cost to you. We have two sheds in our backyard. 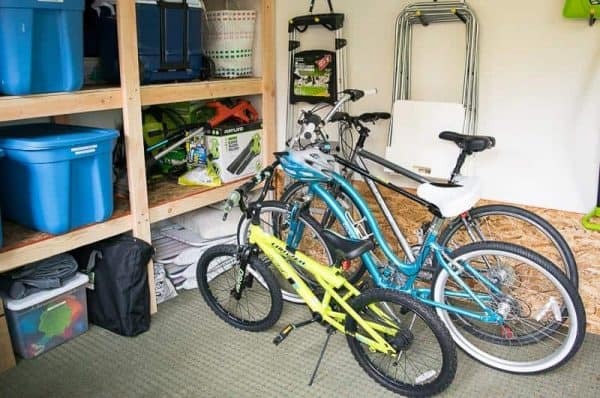 One is a proper building where we store all our off season stuff on these storage shelves, as well as bikes, the lawnmower and other landscape maintenance tools we want behind lock and key. The bigger, battery operated tools are kept on this handy garden tool rack to keep them organized and off the floor. The pegboard walls aren’t particularly useful because the hooks keep falling down! My gardening gloves and a hand shovel are in a dirty bucket on the floor. It’s just a hot mess! I decided to start with a clean slate. Toys were relocated to the outdoor storage bench where they belong. Hooks were reinstalled on the walls for rakes and shovels, and held firmly in place with these clips. But where do you put the smaller items? 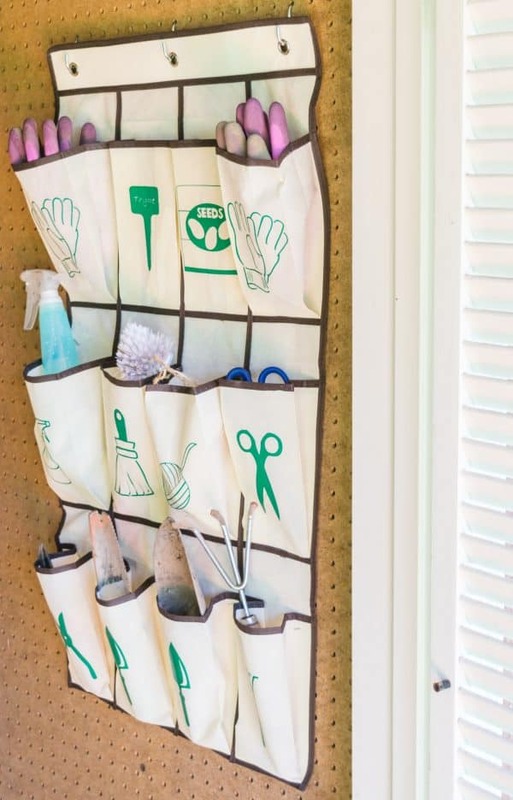 These hanging shoe organizers are great for storing all kinds of stuff. I chose the fabric version so I could attach iron-on vinyl designs, but you don’t have to get that fancy. 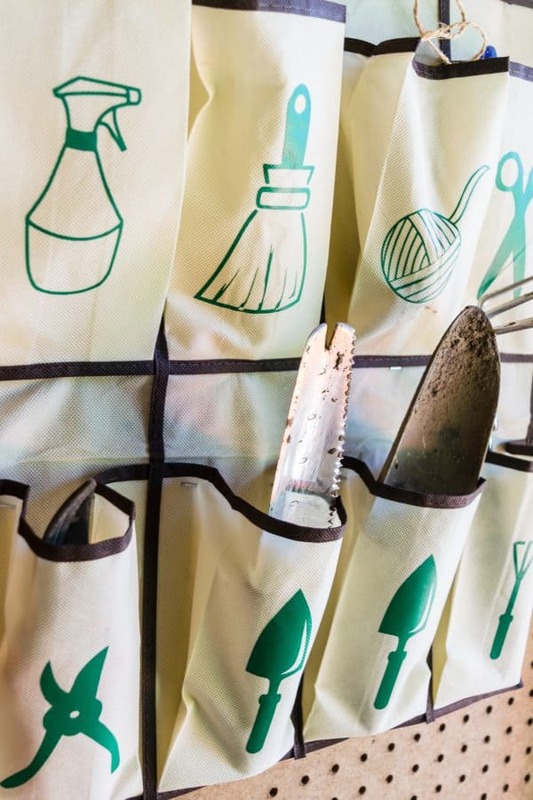 A clear vinyl organizer will allow you to see all your garden tools at a glance! This shoe organizer holds a lot of shoes, but I didn’t need quite that many pockets. I trimmed off the bottom two rows. 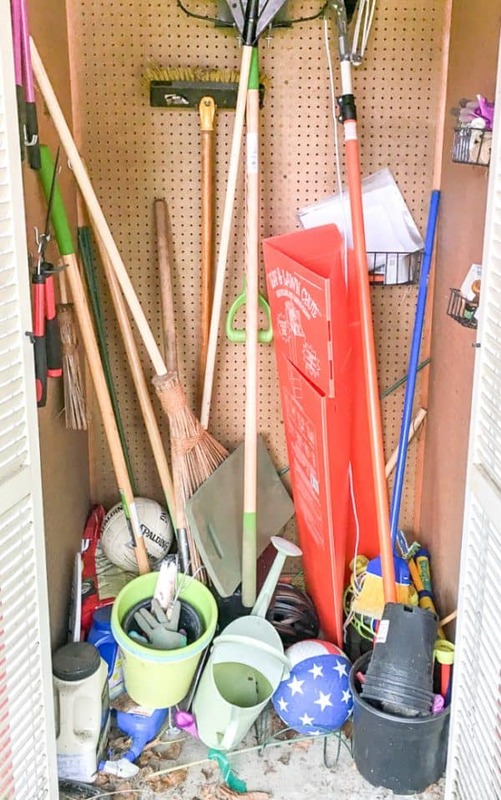 After taking inventory of all the tools you want to store, search for images that correspond to each one (you could also use text if you prefer). 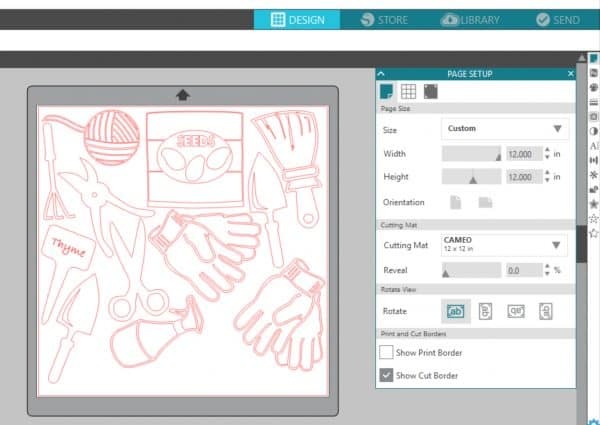 Mine are a combination of clip art I found online and this design from the Silhouette store. I managed to fit all my images onto a single piece of 12″ x 12″ iron-on vinyl. Be sure to flip any images that have text so that they are a mirror image. I learned this the hard way! 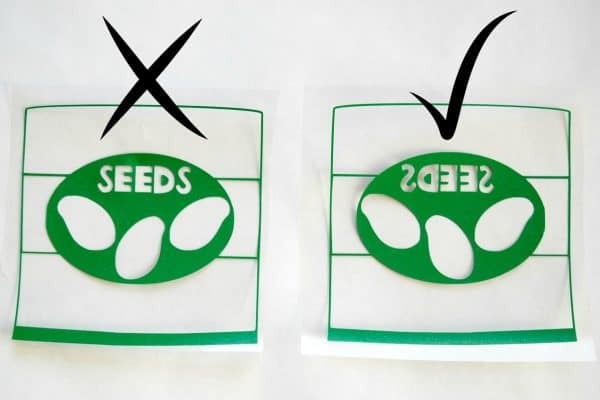 Place the iron-on vinyl onto the sticky mat of your cutting machine with the shiny side down. 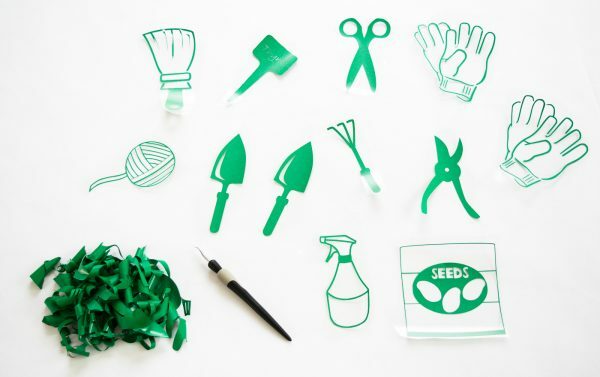 After cutting, separate the individual designs and pick out the excess vinyl. Arrange the designs on the fabric pockets, keeping the heavier tools at the bottom. 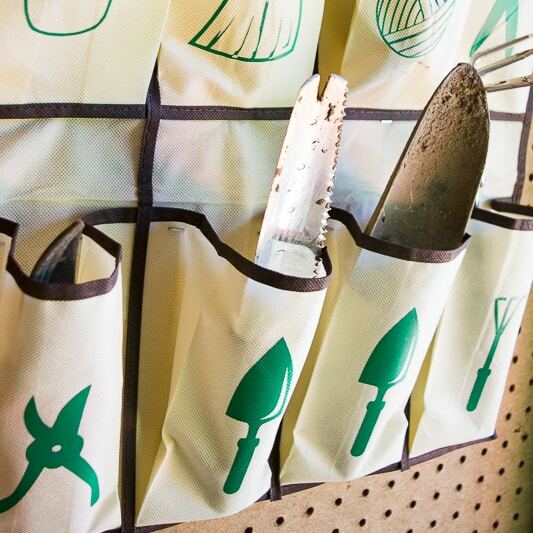 The additional weight will keep the garden tool organizer in place on the wall. 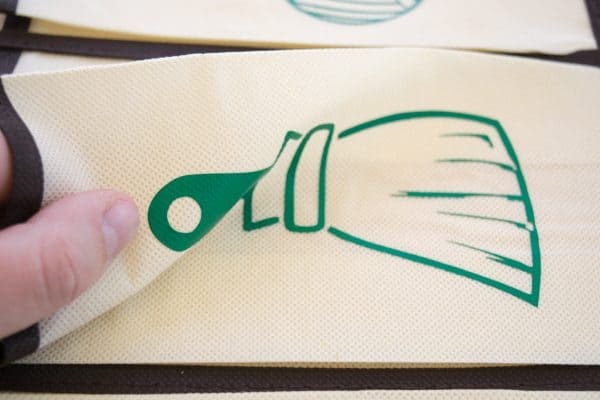 Place a rag on top of the iron-on vinyl, then iron over it for about 30 seconds. Move the iron around a bit so you don’t burn the fabric. 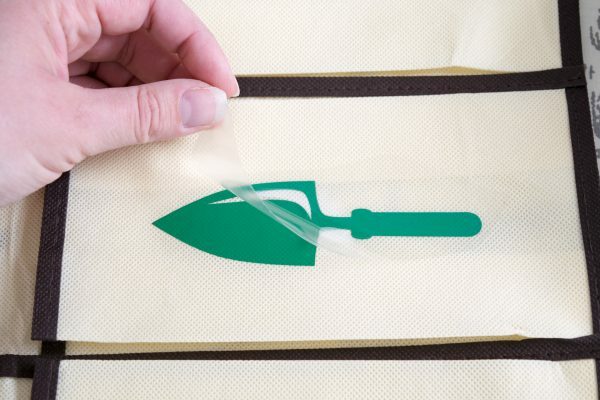 Your design is stuck properly when the clear plastic peels away easily. If the design comes up with it, hit it with the iron again! 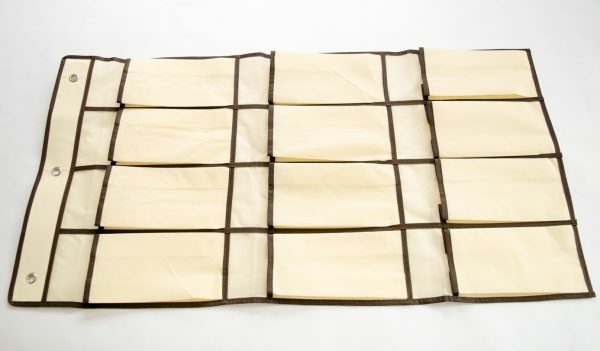 The vinyl material is really flexible and adhered firmly, even on this synthetic material. I could fold the pocket in multiple directions and it didn’t budge! With the labels in place, it’s easy to load up with all your tools. I used hooks on the pegboard wall, but the organizer also comes with hooks to hang over the back of a door if you prefer to use it that way. To prevent the heavier tools from falling forward and out of their pockets, I stapled the folds to the pegboard backing. 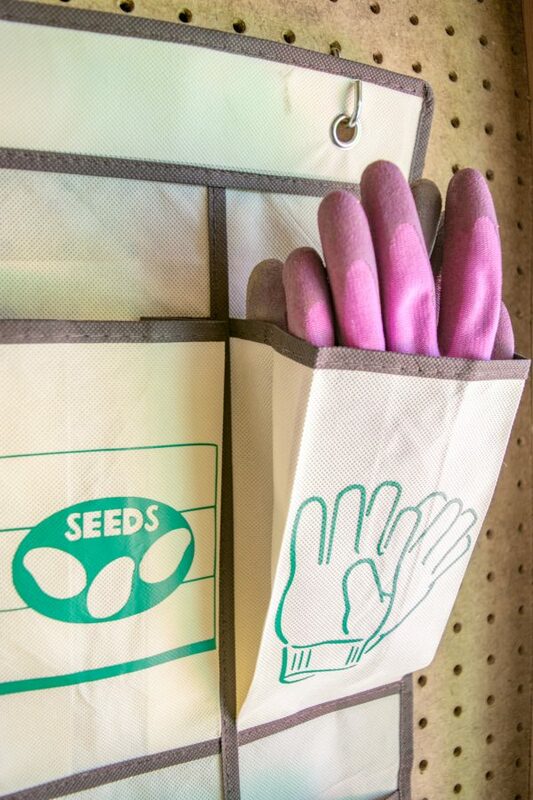 Gardening gloves will no longer go missing! I keep two pairs in this organizer, so I’ll always have a dry set. Now my garden shed is neat and organized! I can easily see what tools are missing and hunt them down before they rust in the rain. And it’s so easy to just grab the gloves and a hand spade to dig up a few rogue weeds as soon as I spot them! 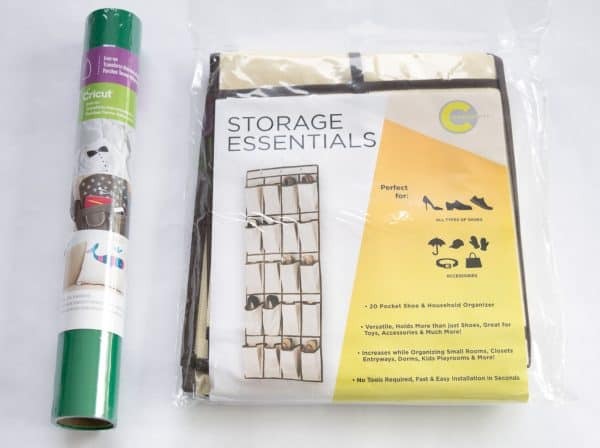 These shoe organizers are so handy for storing more than just footwear! I have plans for a few more projects using them throughout the house! Great idea! I love the idea of an organized garage but we never seem to get there, LOL. Darn it, I threw away the bottom rows! I’m sure I could have found a use for them if I had thought about it! 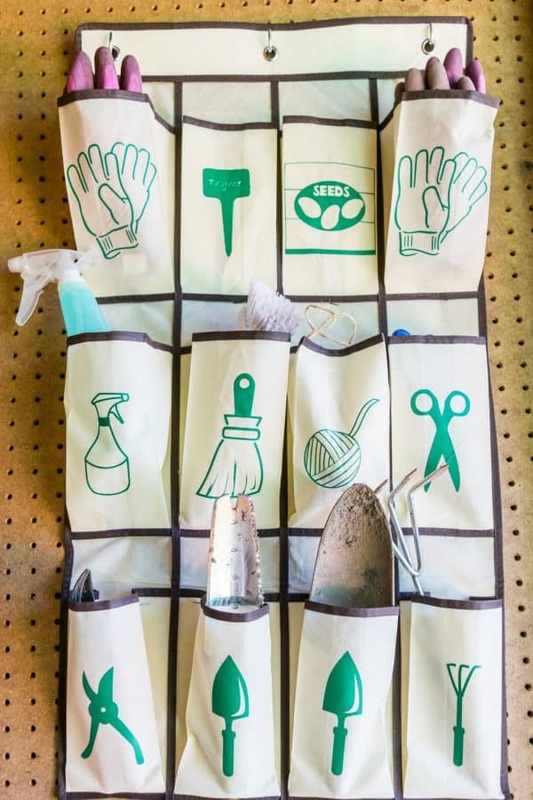 This is an awesome diy for anyone who loves to garden. I have all my tools for my roses stuffed into a pot. But, I am all over making one of these for our home. Thanks for sharing your post at the Inspiration Spotlight @DearCreatives pinned and sharing. Love it, brilliant! thanks so much for sharing way back in July on craft schooling sunday, the party is now back on and hope to see you there!